Open and wooded holes on a former 9-hole ball golf course. Good variety of terrain change - 2 holes with serious water hazards. Dual tees. Park overseen by Police Athletic League. 3450 Monument Rd. South on I-95; SR 9A south (exit 362A) to a left on Monument Rd., then follow directions below. If north on I-95; go right on I-295 (9-A) north (exit 337). Take a right (east) on Monument, 2 miles to a left at the light at Cobblestone into the park. 1st tee in the back by playground and brown fenced Parks Dept. area. Amazing course, one of the best in North Florida. It's a control course with enough long shots that big arms and control players will have a competitive game. It might be a little intimidating for a novice, amateur and pro players will find this course challenging. The park maintains the park (mowing, clearing debris). The local community (RCDG) maintains the baskets and tee's. 18 holes red and blue tee pads + 6 bonus holes. Each hole has multiple target locations. We see 1 or 2 targets changing location each week. Course is laid out very intuitively. You won't have to look hard for the next tee. For the bonus holes (A,B,C play after between 5 and 6) (D,E,F play between 15 and 16 across the road) you just turn right into the bonus hole loops instead of left for the next hole. League plays every Sunday (rain or shine), sign up 9:30, tee at 10am. Great local community with a wide range of players that frequent this course. Most of the holes are long and open, with a few scattered trees. Be careful when you are close to the lake, especially if you are a new player. Good place for distance drives and rollers. This was a good course. I was from out of town(out of state actually) and I had a hard time spotting where to start, but keep looking there is a sign and parking lot at the starting point. I thought the course layout was kinda odd. 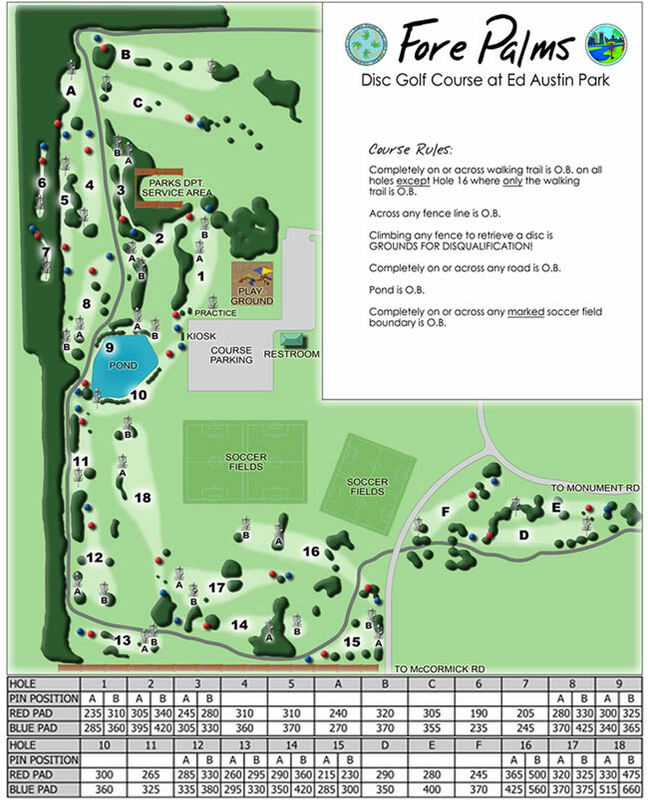 There is a full 18 course labeled and then another course A-F that is split up between the 18 course. So pay attention what runs you are playing on your scorecard. Make sure you don't put a mark down for run C while playing the 18. The course is pretty open for the most part. I definitely used all my discs, which is something I like to have in a course. There is a few holes on the back 9 that are in the woods and are pretty narrow so again I am happy to report this course has diverse runs. There is one run that takes u over a pond... of course I had to go over it, well... what a time for a bad throw. Maybe someday my driver will wash up on the bank. There weren't any par ratings the signs for this course, so I made them up based on prior course experience. All in all I thought it was a good course.